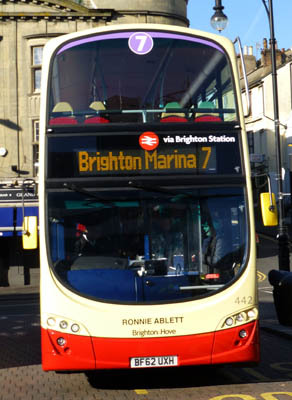 Connections with Brighton and Hove : Ronnie Ablett was a captain in the regular army, stationed for most of his service in Africa, Later he joined the Colonial Service and his last posting was as a district commissioner in Africa. 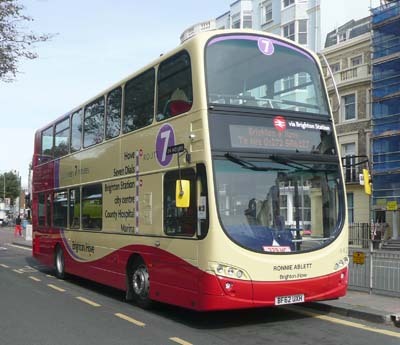 He retired to Hove and became a volunteer driver for the local hospitals. Talking to the disabled people he took for treatment, he found they were very lonely and for most of them the trip to the hospital was the only time they got out of their homes. With other drivers, he hired a hall in 1963 and formed a club which they called the Hove Society for the Disabled. They started fund raising to buy their first ambulance to get people out who had wheelchairs. After 35 years, Ronnie and his wife Irene who had helped him from the beginning decided it was time to retire. But all the volunteer helpers stayed on and the name was changed to the Bluebird Society for the Disabled when Brighton and Hove became a city. Its 50th anniversary will be in 2013. Ronnie was awarded a posthumous MBE in 2001. He was also made a freeman of Hove in 1987. The Bluebird Society for the Disabled, based in Portland Road, caters mainly for older disabled people. It has six people transporters fitted to take wheelchairs. Run entirely by volunteers, it takes members to hospitals and also to theatres. It runs social clubs three times a week and is entirely self supporting. Former Mayor Harry Steer now chairs it and Alison Lapper is honorary vice president. 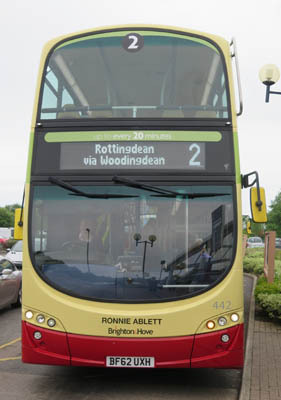 442 Volvo Gemini - carried name since delivery in September 2012 on Route 7. 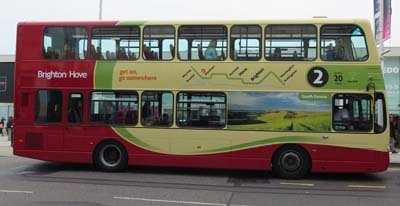 Repainted into Route 2 livery May 2017.